Re-imagining of Mary Shelley's famous creation. When I heard that Aaron Eckhart was going to embody Frankenstein’s monster I must admit I was intrigued. I was excited to see him step out of his comfort zone, as he usually portrays characters that are fast talking rather than physical. With the casting of Bill Nighy and the rest of the familiar cast, my excitement only grew and grew... until I discovered who was making the film and the story they had in store for this classic character. 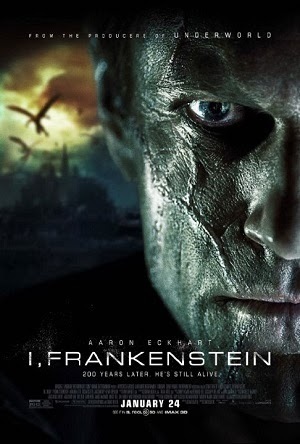 I, Frankenstein begins with a quick retelling of the classic tale we all know where Dr. Frankenstein finds the secret to life with disastrous consequences. When Shelley’s old tale ends, this film's new, but far from original, story takes off running with Frankenstein’s monster getting thrown into a war between Demons, who are after the secret to bringing back the dead in order to take over the world, and the Gargoyles, who are here to protect it. Now, if that sounds really familiar, it’s because it is the exact same story line these filmmakers gave us for Underworld. Not being a fan of the Underworld films, I must say I enjoyed this one more than any of them. Having said that, without the talents of a few good actors – more so that of Eckhart and Nighy than anyone else - the identical story arc makes this almost more disappointing of a film because of the wasted potential. Eckhart can, and hopefully will, play more physical roles in the future, but this film wasn’t the best one to try and showcase his abilities. The rest of the cast stays on par with what you can expect with generically flat characters who deliver annoyingly cheesy dialog. The gothic tone of the film is a great fit for the dark characters, who do everything at night, but all the overly dark blues and purples, which make the world look like it got the crap kicked out of it, look and feel like another Underworld. The CG is shockingly hit and miss, because some of the fighting scenes seem like they never finished the effects and while the gargoyles flying and fighting are the highlight of the entire film, the demons look laughably horrible for such a production. The trend of rarely releasing any noteworthy films in the first months of the year has become such common knowledge for film goers that just being released in January is more than enough to drive them away from a movie. Honestly though, when a studio dumps so much money into such an underdeveloped story about unlikable characters, how can anyone blame them for waiting a few months to spend their money on something worthwhile.